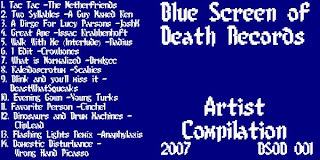 This is the debut artist compilation from Chicago's newly formed Blue Screen of Death Records, which two friends of mine have created (both of which are featured on the comp under their respective monikers BeastWhatSqueeks and Wrong Hand Picasso). 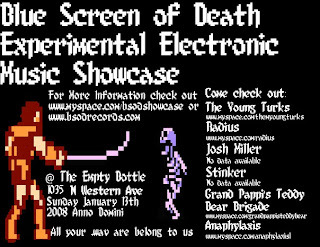 BSOD Records showcases some of the most creative electronic artists in the Chicago scene by not only releasing material as a label, but through hosting live music showcases. The tracks on this compilation vary from glitched face-melting computer-sludged poopskeet to ridiculously catchy scrotum-shriveling electronic wonders. I recommend checking out this compilation as well as their live showcase January 13th @ the Empty Bottle in Chicago (flyer poster below). www.bsodrecords.com for more information.